Home Computing Weekly, 8 May 1984, followed up on its story a month before, about the launch of Mastertronic, with a correction. 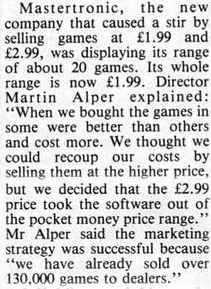 If there had been any intention to sell games at £2.99, it did not last long. The idea was resurrected in late 1985 with the launch of MAD games.